Congenital triangular alopecia (CTA) also known as temporal triangular alopecia is a benign noncicatricial pattern of hair loss. It typically affects the frontotemporal region and rarely involves the temporoparietal or occipital scalp. 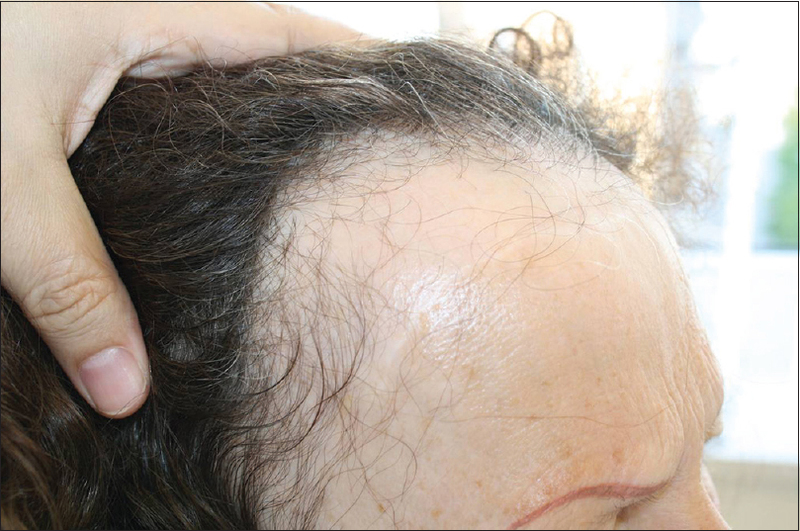 It is a nonprogressive disorder that presents as a triangular, oval or lancet-shaped patch of alopecia. CTA can manifest at birth or develop later in life. The exact etiology of this condition remains unknown. Rarely, it may be associated with other disorders such as Down's syndrome and phakomatosis pigmentovascularis. The diagnosis is based on its distinct clinical appearance. 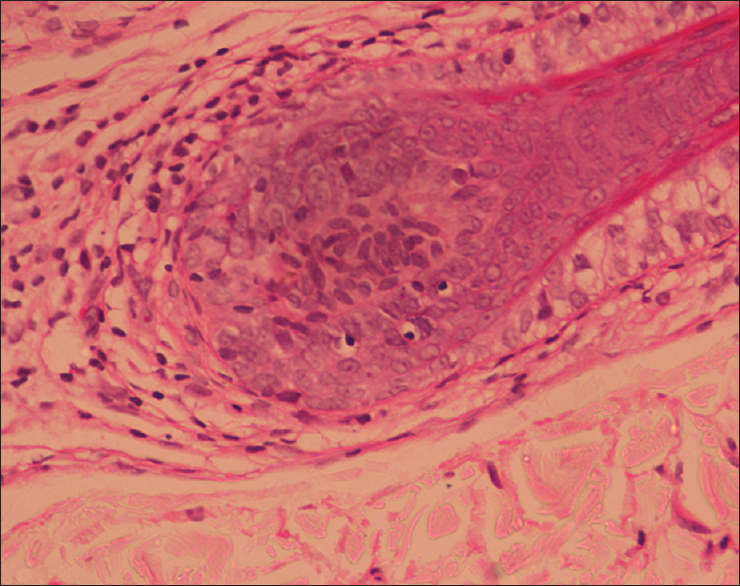 Histologically, hair follicles are miniaturized and replaced by sparse vellus hair follicles. Tricoscopy using a polarized light handheld dermatoscope can be a useful diagnostic tool. 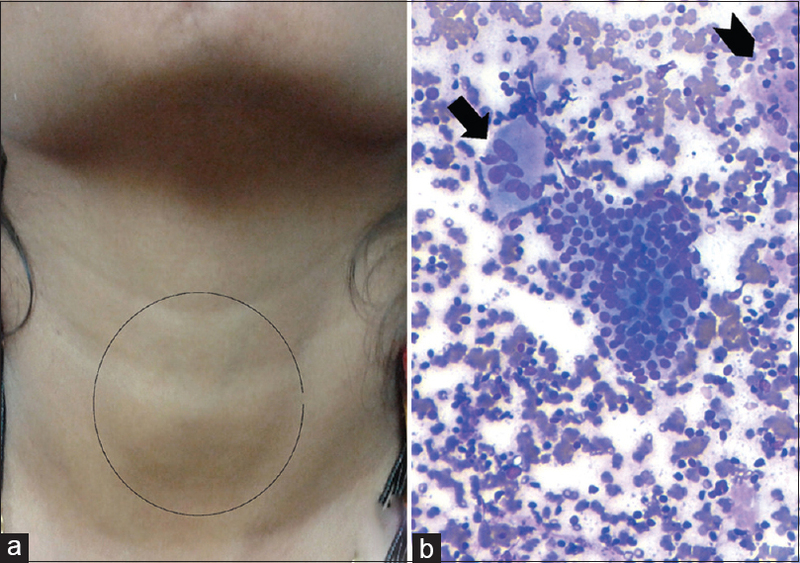 CTA is often asymptomatic and remains unchanged throughout the life. 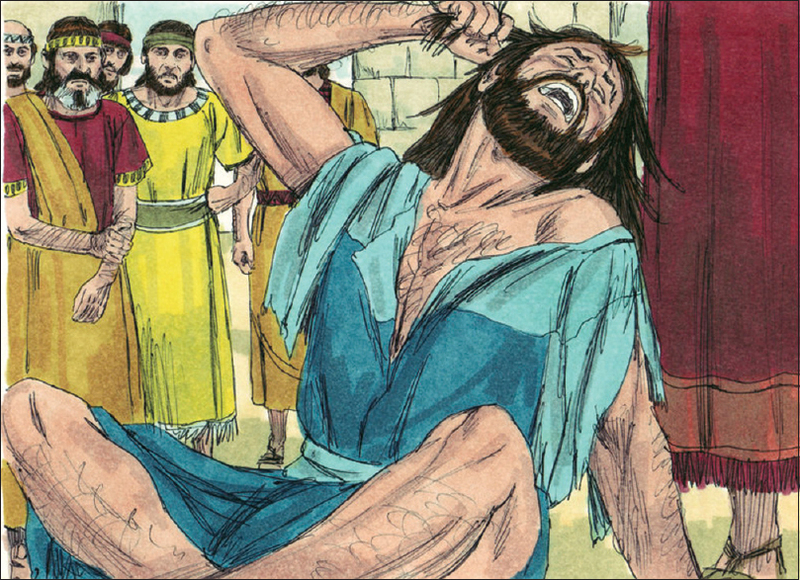 No treatment is required. Surgical intervention with follicular unit hair transplantation can provide a satisfactory cosmetic result. In this paper, we have identified 126 cases of CTA in the published literature cited on PubMed between 1905 and 2015. From the available evidence, 79% of patients with CTA presented with unilateral hair loss, 18.5% with bilateral involvement and rarely, with occipital alopecia (2.5%). There was no gender predilection. These figures are entirely consistent with previously published data. Physicians should remember to consider CTA as a potential diagnosis in any patient presenting with a nonscarring alopecia in order to avoid unnecessary investigations and treatments. Androgenetic alopecia (AGA) and alopecia areata (AA) are common hair loss disorders affecting both men and women. Despite available therapeutic options, search for new, more effective treatment is constant. Platelet-rich plasma (PRP) could be effective in promoting hair growth: (1) To present PRP and its mechanism of action in promoting hair growth and (2) to evaluate its preparation methods and its therapeutic potential in noncicatrial alopecias in a systematic review. An international bibliography search, through five databases, was conducted to find articles regarding PRP's action on hair loss. Growth factors in platelets' granules of PRP bind in the bulge area of hair follicle, promoting hair growth. 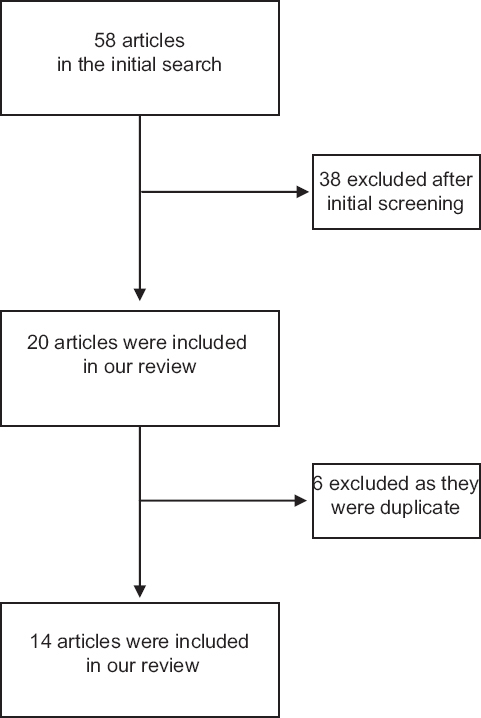 In our systematic review, 14 articles matched our criteria, including 12 articles for AGA and two for AA. 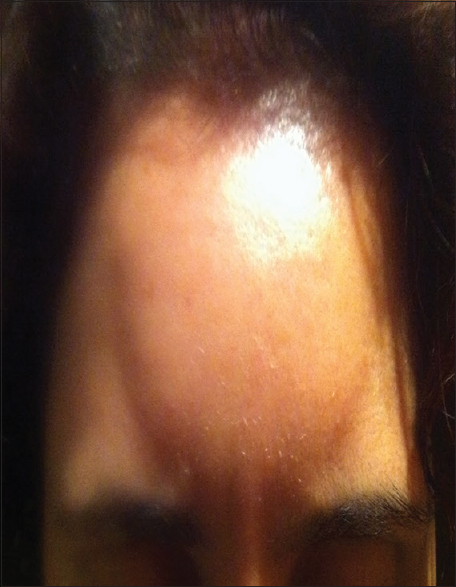 PRP is a potential useful therapeutic tool for alopecias, without major adverse effects. Nevertheless, due to the small number of conducted trials, further studies are required to investigate its efficacy. 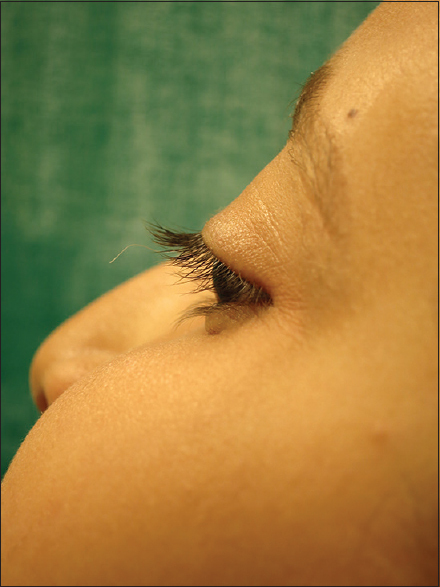 A case of frontal fibrosing alopecia with nail involvement is presented. Nail involvement provides evidence for underlying lichen planus, and that the disease represents a rather generalized than localized process. Favorable response of the scalp condition to oral dutasteride points to an inflammatory reaction on the background of androgenetic alopecia. 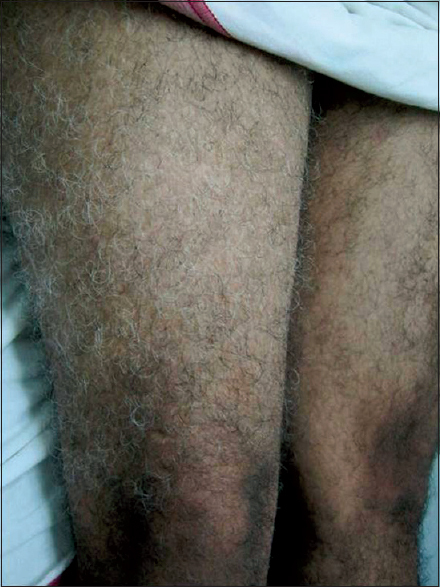 Congenital generalized hypertrichosis terminalis is a rare primary hypertrichotic condition, of unknown etiology presenting in the pediatric population. Though benign in nature, there is considerable psychosocial trauma attached to this, owing to the cosmetic disfigurement it produces. The association of gingival fibromatosis and a coarse facies could further worsen the cosmesis. Thus, a multidisciplinary approach involving a psychologist, a dentist apart from the dermatologist would be mandatory. We present this rare syndrome with the purpose of getting a better insight regarding the inheritance, the clinical features and the best available treatment modalities, especially the modern and novel techniques of hair removal that could be utilized to manage such individuals. Frontal fibrosing alopecia (FFA) is a cicatricial alopecia that affects mainly postmenopausal women. It is typically characterized by recession of frontotemporal hairline. Hair loss of eyebrows, eyelashes, axillae, limbs, and pubic area may be observed. Here, we describe a case of FFA in a male patient presenting with only localized loss of sideburns. 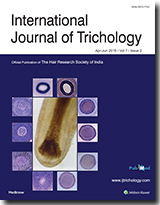 Skin biopsy findings were consistent with lichen planopilaris. To our knowledge, this is the only reported case of FFA patient with only localized loss of sideburns. 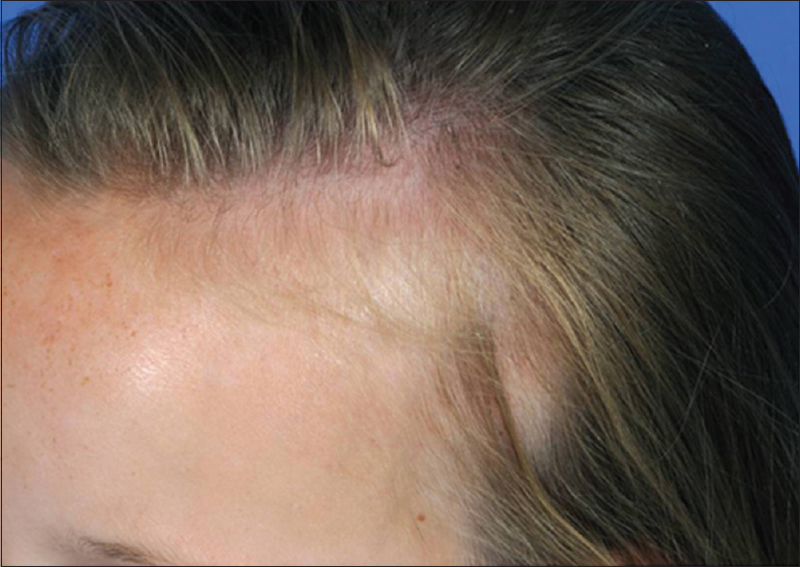 Patchy alopecias of the scalp are frequently seen in clinical practice. 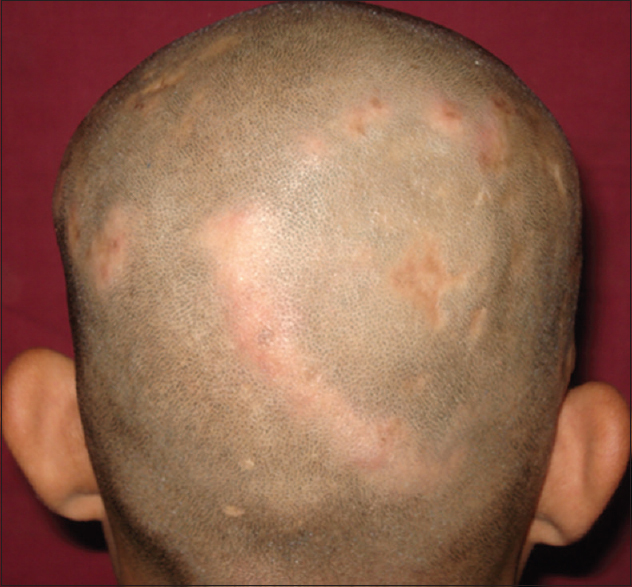 We report a young man who presented with progressive patchy alopecia of the scalp, which was finally diagnosed to be due to tuberculoid leprosy. Progression of alopecia was stopped after anti-leprosy treatment was instituted. Despite high prevalence of leprosy in our country, scalp affection due to leprosy is extremely rare but important to recognize. The genetic background of alopecia areata has only recently begun to get unraveled. We report the association of a case of pediatric alopecia areata with a rare genetic syndrome-blepharophimosis-ptosis-epicanthus inversus syndrome (BPES), which responded well to topical immunotherapy with diphenylcyclopropenone. In the background of increasing evidence surfacing on the genetic basis of alopecia areata, this association may be of significance. Solitary trichoepithelioma of the eyelid is a very rare tumor, which needs to be differentiated from basaloid epithelioma and basal cell carcinoma. Diagnosis is based on clinical and histopathological examination. 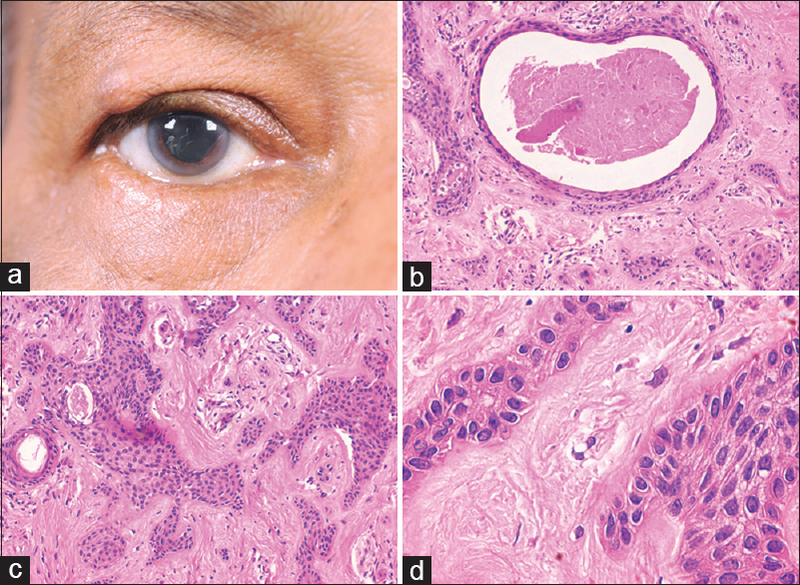 We present a case of an eyelid trichoepithelioma presenting as a long standing nodule with associated dermatochalasis. Although rare, this entity should be kept in the differential diagnosis of chronic, firm, nodular eyelid lesions. Woolly hair is a rare congenital abnormality of structure of the scalp hair characterized by tightly coiled hair involving part or the entire scalp. There are mainly two types of woolly hair; autosomal dominant/hereditary woolly hair and autosomal recessive/familial woolly hair. We hereby report two cases of autosomal recessive/familial woolly hair from a single family associated with complete atrioventricular dissociation in one sibling, which is a very rare association and only a single case has been reported in literature with this association. This case report signifies the importance of cardiac evaluation in woolly hair and stresses the fact that hair examination is not just cosmetic but can be lifesaving.